Malic Acid, Natural And Artificial Flavors, Citric Acid, Sucralose, Silica, Acesulfame Potassium, FD&C Red 40. Malic Acid, Natural And Artificial Flavor, Citric Acid, Trisodium Citrate, Silica, Sucralose, Acesulfame Potassium, FD&C Red 40, FD&C Blue 1. Malic Acid, Trisodium Citrate, Citric Acid, Natural And Artificial Flavor, Silica, Sucralose, Acesulfame Potassium, FD&C Red 40. 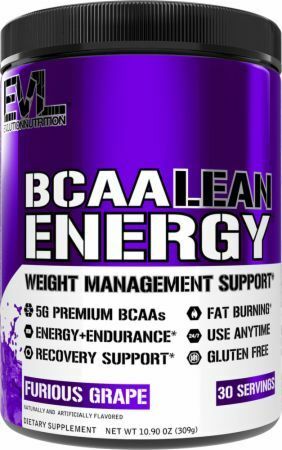 BCAA Lean Energy is one of our top "Energy Aminos" formulas, with some great goodies inside! See our BCAA Lean Energy blog post for the most up-to-date information on this formula! BCAA Lean Energy contains the highest quality of BCAAs and natural energizers along with zero sugar and carbs. Nothing else offers so many benefits! Once you make the switch, you will never go back! With zero carbs and zero sugar why turn to coffee, soda, or sugary energy drinks?